If you’ve ever been to the island of Fiji, you’ll know just how beautiful it is. With its pristine white sandy beaches, and it’s crystal clear blue seas, it really is a place of natural beauty and wonder. If you haven’t yet been, you need to put it on your (soon) to do list. 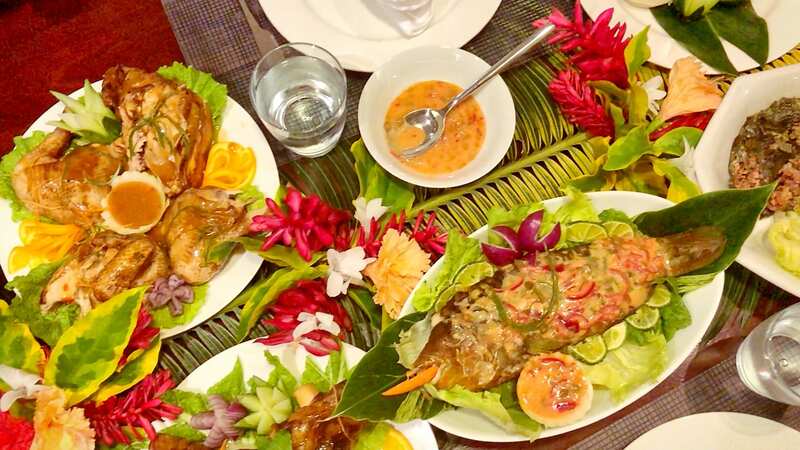 As well as the alluring scenery, another unforgettable thing about Fiji is the amazing cuisine on offer. Grand feasts are displayed made up of succulent seafood and tantalizing meats including fish, chicken, and pork, much of which has been prepared using the Lovo oven. What is a Lovo Oven? The lovo oven is one of the most ancient and simple forms of cooking. In the western world, it’s more often referred to as an earth or ground oven. While it used to the be the main, and only form of cooking for some, today, the lovo oven is more likely to be used on celebratory occasions or for ceremonial reasons. Essentially, the Lovo oven is a pit in the ground that’s used to trap heat in order to steam, bake, or smoke all kinds of delicious and nutritious foods. To cook using the Lovo oven, the food must first be wrapped in either banana palms or leaves. It’s then placed carefully onto the smoldering hot rocks inside the pit. 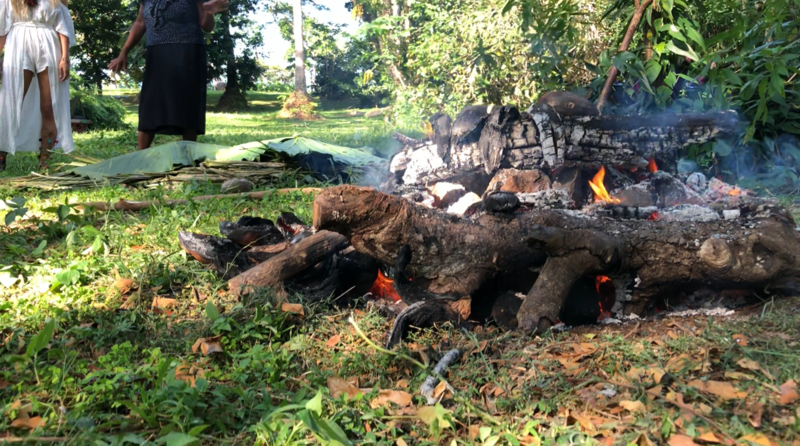 To help with the steaming process root crops such as uvi, dalo, and cassava are placed on top. This creates moisture which in turn creates steam as it heats up. Before we delve straight in and teach you how to make your own Fijian lovo, first we’ll share with some facts about the South-Pacific island just so you can get a feel for what the culture is really like there. Fiji is a country that’s made up of a collection of around 300 islands, with the largest of them, called Viti Levu (”Great Fiji”), being situated on the southeast coast. This island accounts for more than half of Fiji’s total land area. The island is located in the South Pacific Ocean, around 1,300 miles off the coast of Auckland, New Zealand. The capital of Fiji is Suva and more than 77,000 people are estimated to live there. Much of Fiji is the product of volcanoes and coral formation. In the summertime, the average temperature in Fiji is around the mid-80s °F (about 27-29 °C). During winter, the temperatures dip a little to somewhere around the high-60s °F (about 20° C). Fiji’s economy relies largely on agriculture and tourism in which to make its money. The country’s main produce is sugar cane, which makes up around a third of all its industrial activity. Tourism has been quite big in Fiji since the 1980s and now brings in more than 450 million FJD annually. While it may be true that the way to a man’s heart is through his stomach, when it comes to making the lovo, it’s traditional for the men to make it, not the women. But, in this day and age, it’s quite common for women to prepare them too. Before you start preparing the food, it’s a good idea to start making the lovo oven. To do that, you need to first dig a pit that’s big enough to fit the amount of food you’re going to cook. A hole that’s around 2 ft deep and 3ft wide should be plenty big enough for most average sized gatherings. If you’re catering for more, simply dig a bigger hole! The next stage of building your lovo oven involves placing large bricks or stones around the inside of the pit. This will insulate the walls, creating a kind of oven effect. Then, simply add some firewood and kindling on top. Hard woods such as hickory and oak work best as they are slow burners so you won’t need to constantly fuel the fire with more wood. The next thing to do in preparation for your feast is to gather the right amount of ingredients for the number of guests coming. 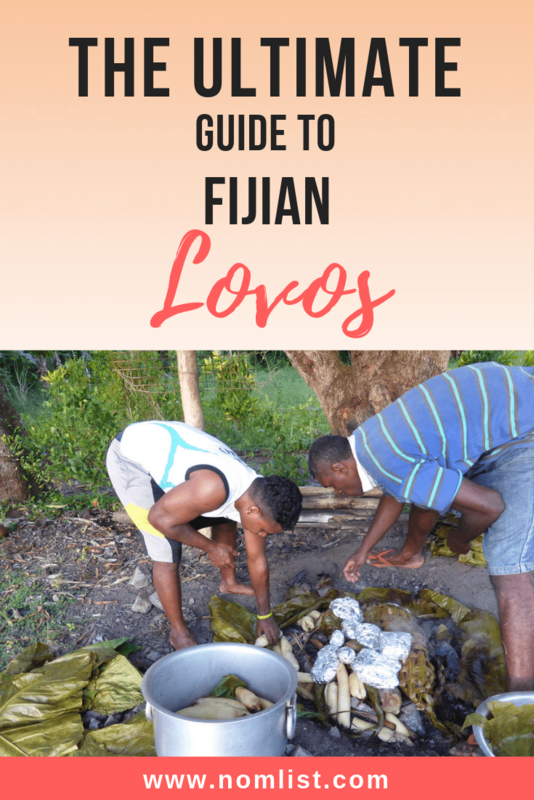 Traditional Fijian lovos consist of lots of food, so don’t be stingy! Typical raw ingredients used include several different types of meat such as pork, chicken, and lamb; a selection of the finest seafood; and an abundance of tasty vegetables. And of course, let's not forget all the delicious desserts too. Everything gets cooked together when using a Lovo oven, so don’t be alarmed when you see enough food in front of you to feed an army. To help you plan your menu, the top 10 dishes served at a Fijian Lovo can be viewed in the next section. Food will always be more flavorsome when it’s had time to marinade, and flavor is a big part of the Fijian Lovo. So, once you’ve gathered all your meats that you’ll be using simply add your seasoning or marinade and wrap it tightly in foil. One quick tip: the longer it has to marinade, the tastier it will be. 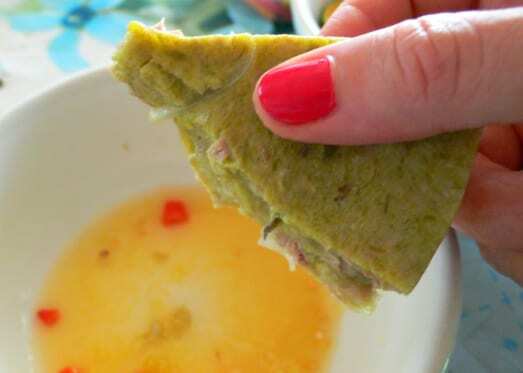 Palusami is a traditional Fijian dish that consists of taro leaves and coconut cream. It’s a delicious dish that’s easy to make and enjoyed by both residents and tourists. To prepare your palusami you need to first grab yourself some taro (dalo) leaves and lay them out in piles from smallest to biggest. The next step is to chop some onion, garlic, and ginger. Some people also like to add thyme and sage too. Then, add all of these ingredients to the coconut cream along with a tin of corned beef and stir it all up. Next, you need to lay out tin foil out on the work surface and place the taro leaves on top. Then spread the palusami mix so that it’s sandwiched between two layers of leaves. Finally, you need to roll it all up into a relatively small parcel ready to be cooked in the lovo oven. It’s now time to go back to the lovo oven and light the fire. After the wood and kindling have been lit, more rocks are added on top of the fire. Eventually, the firewood will collapse and the burning stones will fall into the pit. When there are no longer any flames, just nice, hot coals, the lovo oven is ready to use. If you’re planning on using a grill to cook your meat and vegetables on, now’s the time to do it. The grill is simply made from layered banana leaf stems. However, it’s not essential to have a grill and many traditional lovo ovens do without, cooking the food right on the stones. With the lovo oven now in full operation, it’s time to start cooking the food. So, grab all that food you prepared earlier and lay it on top of the grill or stones with the meat at the bottom of the lovo and the vegetables and desserts near the top. Cover the food with banana leaves while cooking to trap the steam. Then cover with soil or sackcloth and tarpaulin for further insulation. Leave everything to cook for around two hours or so, occasionally flipping the food for the best results. Then, simply remove the food parcels from the lovo oven and enjoy! This dish consists of freshly caught, locally sourced, fish that’s been marinated in a blend of zesty citrus juices. It’s then mixed with tomatoes, onions, chilies, and coconut cream to give it that explosive Fijian taste. 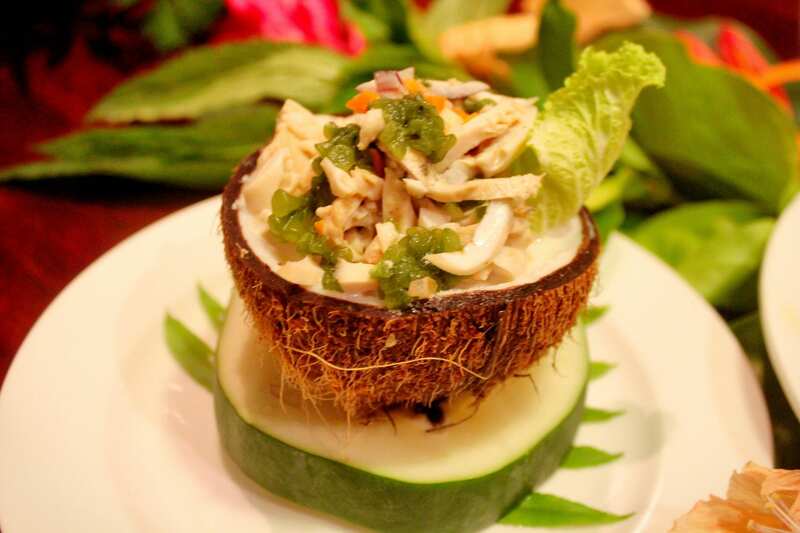 Kokoda is traditionally served in a coconut shell or large clamshell. Chicken is a popular dish at lovos. Whether it’s been marinated in a concoction of delicious herbs and spices or used to make a delicious curry, you can be fairly certain of seeing chicken on the lovo menu. 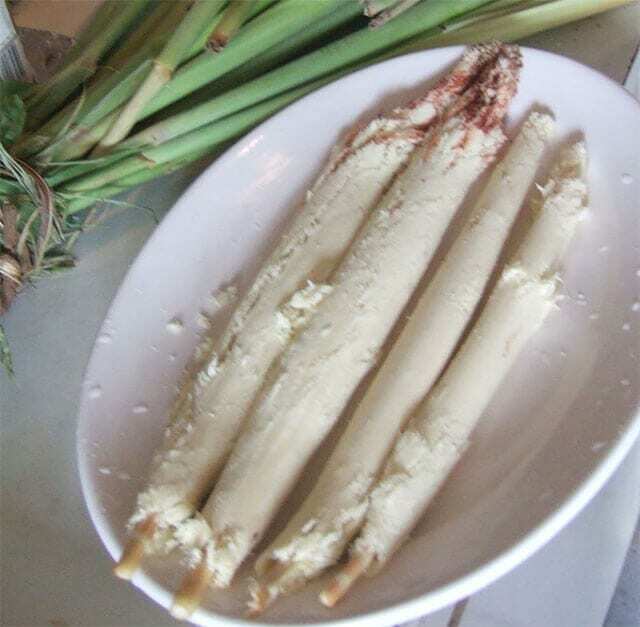 This another of Fiji’s staple foods and is often referred to as the “Fijian Asparagus.” The duruka is the unopened flower of a cane shoot and is a close relative to sugar cane itself. It’s often added to curries but can also be eaten on its own. Click here for a mouth-watering duruka curry recipe. 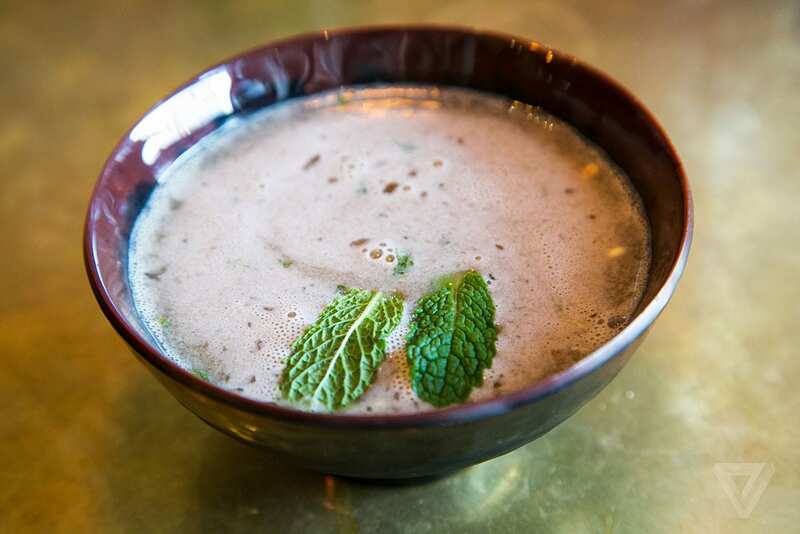 Kava is a drink that’s usually drunk before the lovo begins. It does have an acquired taste and may not be to everyone’s liking, but is an important part of the Fijian culture all the same. Kava is well known for its medicinal properties and is used by many nations across the world in the treatment of both physical and mental ailments. The way kava is prepared is usually like a tea, with the kava being put in a strainer bag and left to stew in warm water for a few minutes. Please note that kava does have a kind of sedative and euphoric effect and should therefore only be consumed by adults. 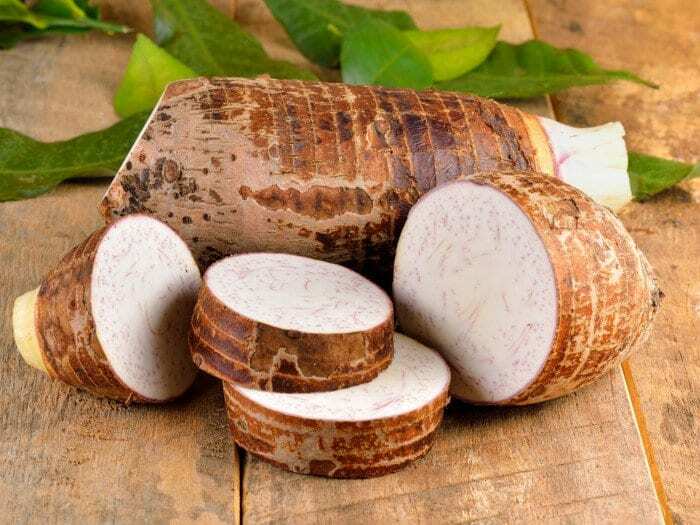 Cassava is another name for tavioka and it’s another of the most popular root vegetables used in Fiji. As well as being used in main dishes, this tasty shrub is also used to make cake and is almost always eaten at Fijian lovos. 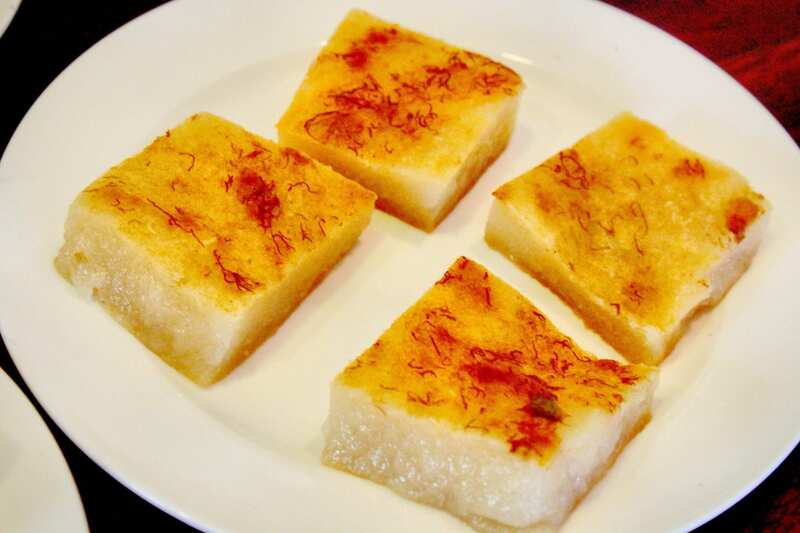 Check out below for a great cassava cake recipe. 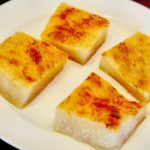 This is a classic Fijian dish made by mixing seaweed and coconut together to form a kind of jello. You get a bitter taste from the seaweed mixed with the sweet taste of the coconut and is sure to send your taste buds in a spin. 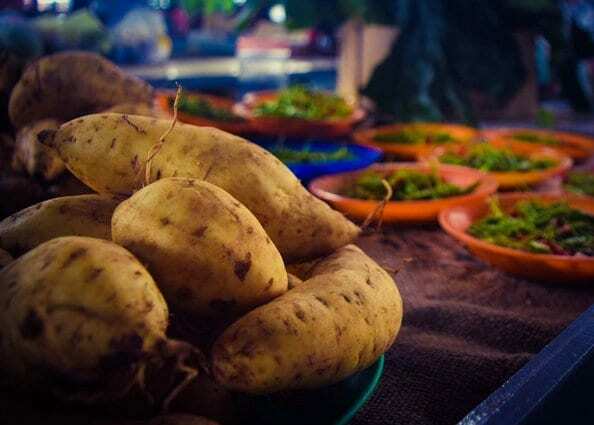 The kumala is the Fijian name for sweet potato. And although it’s not a staple food of the country, it’s still very popular as is so versatile. 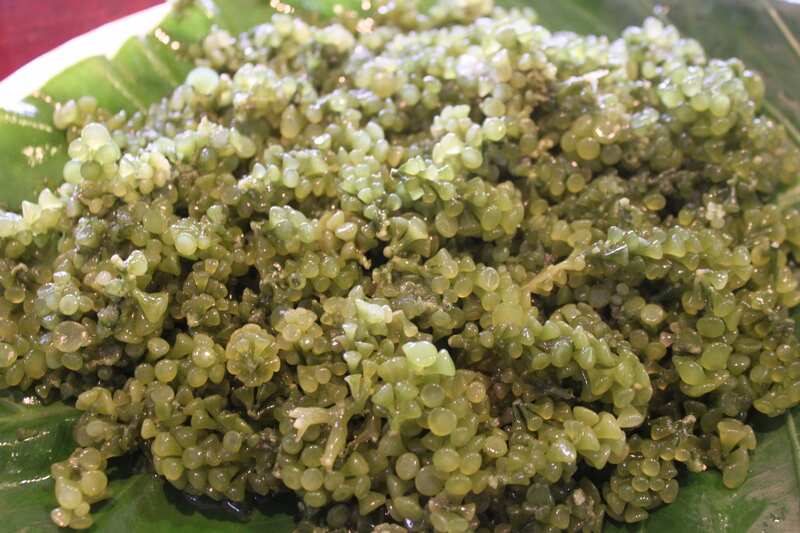 This is a type of seaweed and is often referred to as sea grapes. In Fijian cuisine, these tiny beads are cooked alongside fresh coconut, lemon juice, chili, and salt to create an explosion of the senses. Click here for a great sea grape salad recipe. Taro is a very versatile root vegetable that’s similar to spinach and can be served in a number of different ways. It’s considered to be the staple food of Fiji and residents and tourists alike love it. This is another important food of the Fijian culture. 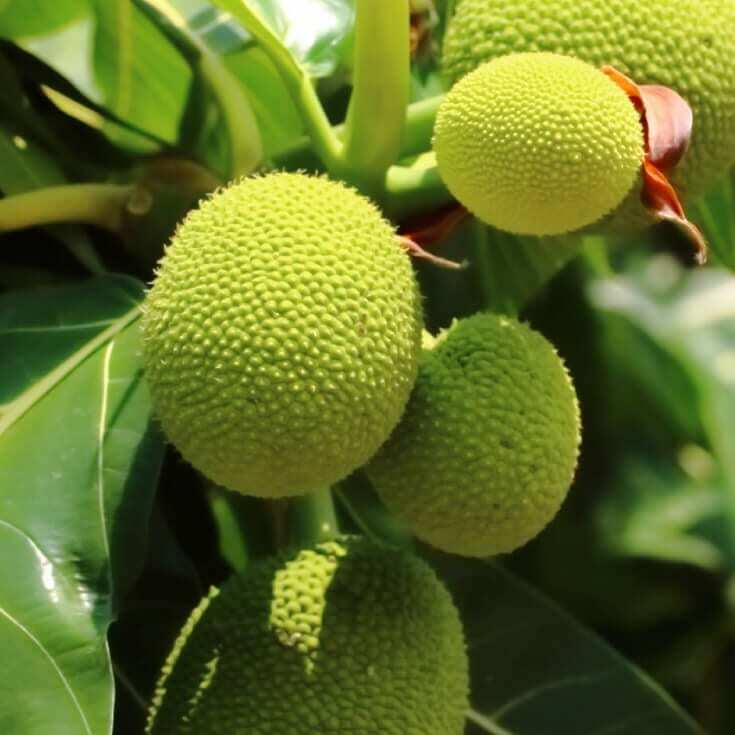 Breadfruit is a fruit that’s green on the outside, the size of a melon, and has a texture similar to that of a potato. It’s a very versatile fruit that can be used in both sweet and savory dishes. Some even ground it up to use as flour. 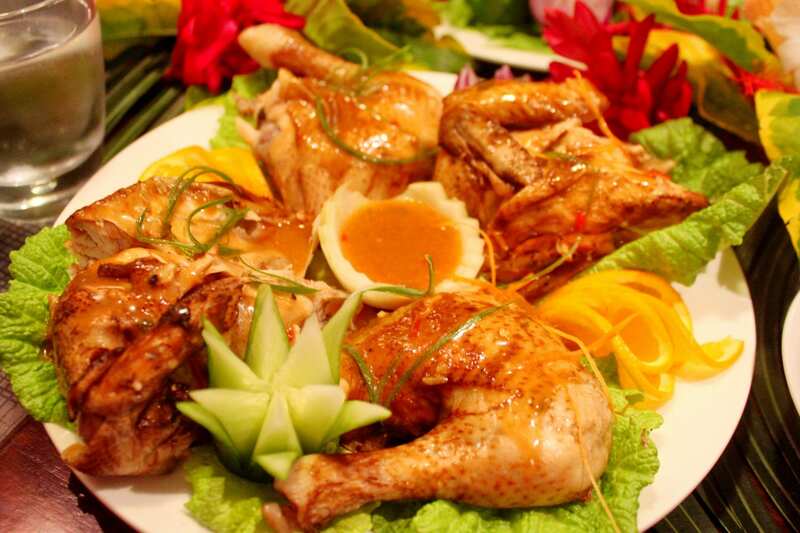 In order for you to get the true Fijian lovo experience, you need to make sure the food is authentic. So, to help you do that we’ve included a quick and easy traditional Fijian recipe for you to try to get you started. This is one of the simplest, yet most enjoyed desserts served in Fiji today. Preheat the oven to 350℉ . Brush oil lightly over an 8-inch cake pan. Beat together the coconut cream and sugar. Mix in the grated cassava. Pour into the cake pan and bake for around 45 minutes or until the top is golden brown. We hope you enjoyed our ‘Ultimate Guide to Fijian Lovos’ and now feel much more knowledgeable as to what to expect if you do ever get the chance to visit one. Or, if you’re feeling adventurous, why not recreate the whole experience at home using the above step-by-step guide and scrumptious recipes instead? !